Let's Celebrate in Epic Style! My oldest son is having a birthday this week, and I needed to get a birthday card completed. This will be my third card in a month because of my left hand surgery, and it is a slow and methodical process! I am still in a cast that covers my left thumb and extends 3/4 of the way to my elbow. This Friday is removal day, and I can't even express how glad I am! I digress...back to my son's birthday card. Ingredients: Stampin' Up products: Papers~ Cardstock--Basic Black, Whisper White. Pattern: Pick A Pattern dsp (stripe); Wood Textures Paper Stack. 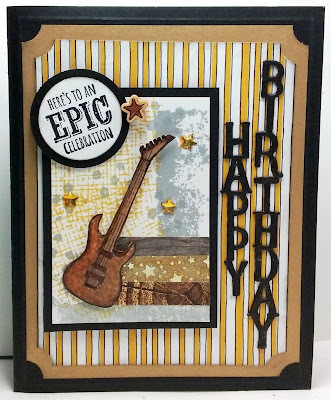 Stamp--Epic Celebrations (2018 SAB); Timeless Textures (2019). Ink--Crushed Curry; Smoky Slate. Washi Tape--Myths & Magic/ silver glittery (Copics Gold colored)(2018 Occ). Embellishments--Hearts & Stars Wood Elements (star-Copic colored center); Metallic Enamel Shapes (stars-silver/ Copic Goldcolored)(2018 ret). Other: Paper--Recollections Gold Frosted Shimmer. Memento Tuxedo Black Ink. 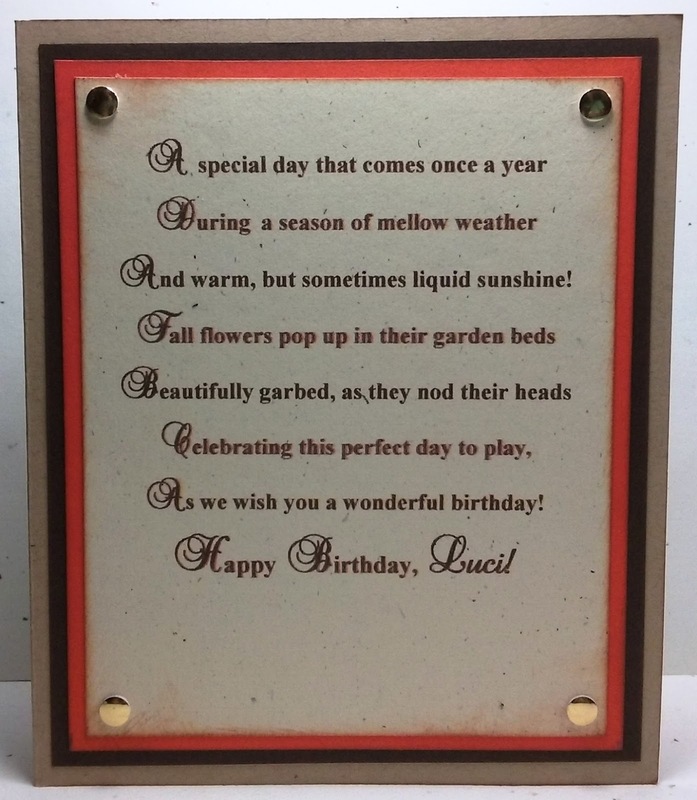 Dies--CraftsSuppliesForU/ Vertical Happy Birthday. Punch--WRMK Stub Corners. 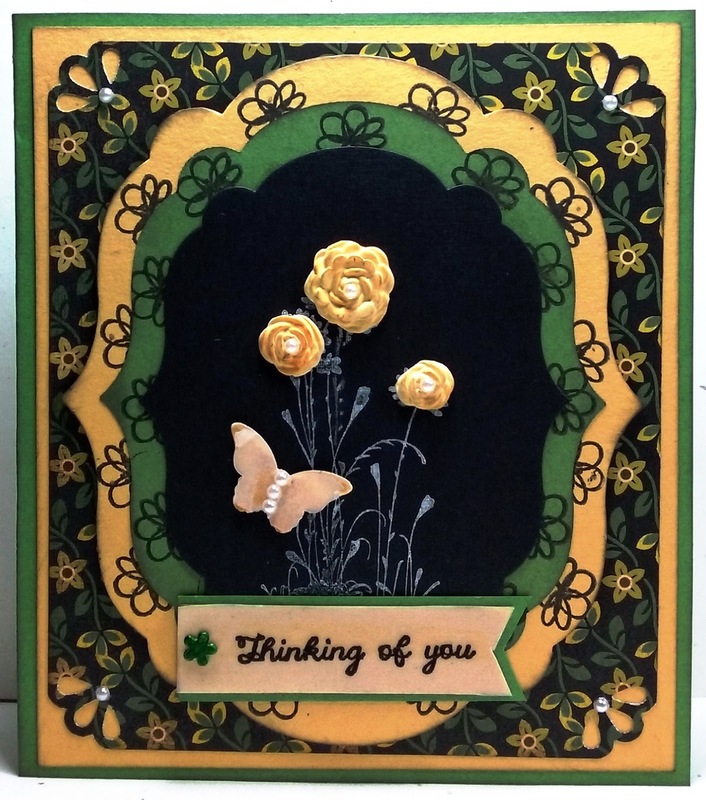 Wink of Stella/ Clear (black circle mat, HB sentiment die-cut, edge of Gold Shimmer paper to add more sheen.). Copic Markers--Guitar coloring. Stars and glimmer star washi (silver to gold) + Wood star center to dark brown. Chatterbox verse. Size: 4-3/4" X 6". Watercolor Wings for a Beautiful Insect! 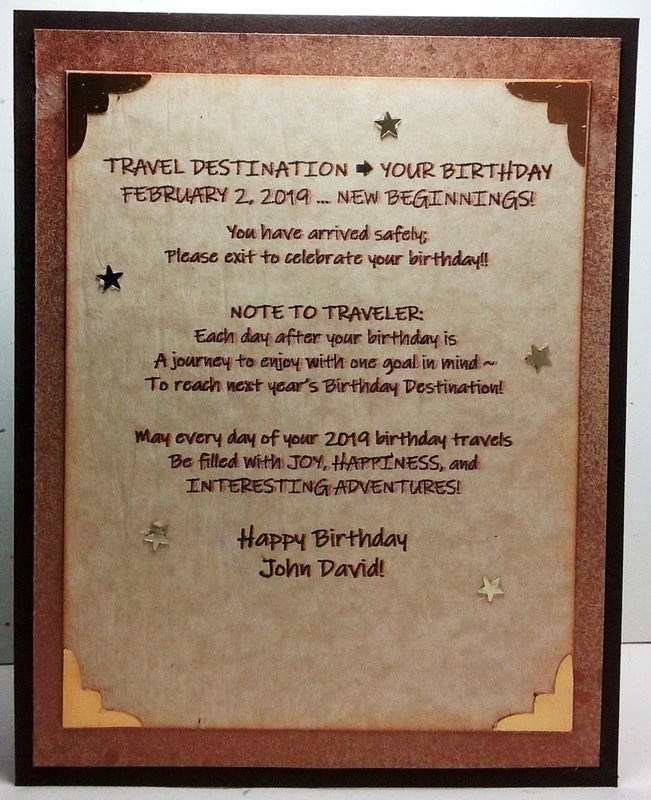 A good friend and Splitcoaststamper (SCS) teammate had a birthday right before Valentine's Day. Unfortunately, I had thumb basal joint surgery at the beginning of February, and my left hand is still in a cast almost to the elbow to allow healing where The basal thumb bone was removed and replace with tendon plaiting to act as my future thumb cushion. Four days after surgery, I managed to finish a card for another friend with an earlier birthday. It was already designed with its pieces already stamped and the selected patterned paper cut to size. I just needed to select my cardstock colors, do a little mat layer die-cutting, fussy-cutting, and gluing to finish. But I did find it stressed my hand and caused some added pain. It was a message to me I was doing too much too soon as I had previously been relatively pain free! I needed to wait a few weeks longer before trying it again. This week-end was the time so my birthday card would not be any later. Per my usual mode of operation, I caught my SCS challenge list up to date, and then I browsed for ideas and inspiration. I really liked the pattern paper collection used on my previous card, because I love the blues and greens color combination. It seemed I was destined to stick with them, because one of the first things I spotted in the SCS Inspiration challenge was a canvas in very similar hues with butterflies! 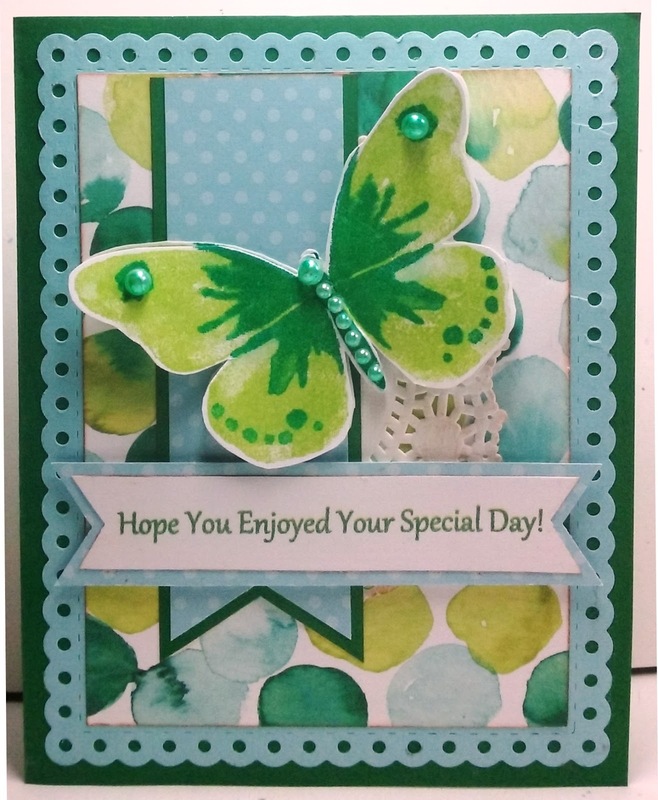 I'm really tired of winter, so building my card design around a beautiful spring insect, the butterfly, was perfect! You may wonder the focus on an insect? One of the challenges I wanted to enter this card into is the SCS Alphabet Challenge for Letter "I". I decided to used the same paper collection, Naturally Eclectic, though different paper patterns, plus I focused on a light blue and green instead of navy and green. Take a peek below at the finished inside and outside designs...not bad totally one-handed! Ingredients: SU Products: Cardstock--Whisper White, Bashful Blue (ret. ), Emerald Envy. Patterns--Naturally Eclectic/ 2018; DSP Stack-Subtles 2012-2013/ Bashful Blue Dots. 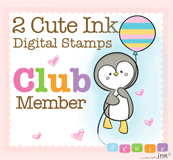 Stamps (ret. 2018)--Watercolor Wings; Sweet Cupcake (sentiment). Ink--Lemon Lime; Emerald Envy. Punch--SU-Banner Triple; M. Stewart-Butterfly Trio. Die--Leafy Eyelet Scallop. SU Basic Pearls (Copic colored). Chatterbox sentiment/ verse. Size: 4-3/4 x 6". Bright Green, Navy, & Lemon Lime for a Birthday! A friend has a birthday just a few days before Valentine's Day. I found I can do a bit of cardmaking after my hand surgery...one-handed as long as I take it slow since it isn't my predominate hand. I can hold things still with the weight of the cast as long as I do not put any pressure on it and keep it in a relaxed state. So, I may get a few cards done if I'm lucky without causing undo pain. I've had this pretty patterned Stampin' Up paper called Naturally Eclectic for about a year, and I thought I'd use it along with the companion stamp set. 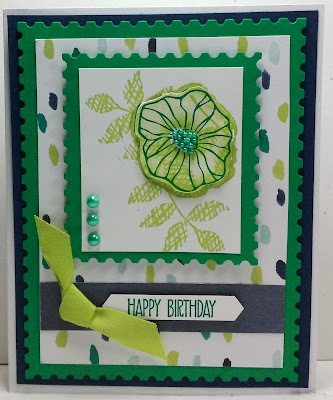 I focused on the two-step stamped flower and double stamped it twice, and then fussy-cutting one to pop and layer over the other on its small rectangular flower panel. To finish it, I mat-framed it with a postage stamp edged die, and I used its larger size to mat-frame my patterned background paper. The card fell together fairly easily, except for the modification I had to make for my smaller postage mat-frame to fit the size I wanted my stamped flower panel to be. I designed the inside to match elements found on the card front and composed a little birthday verse for my friend. Take a peek below at the finished design. 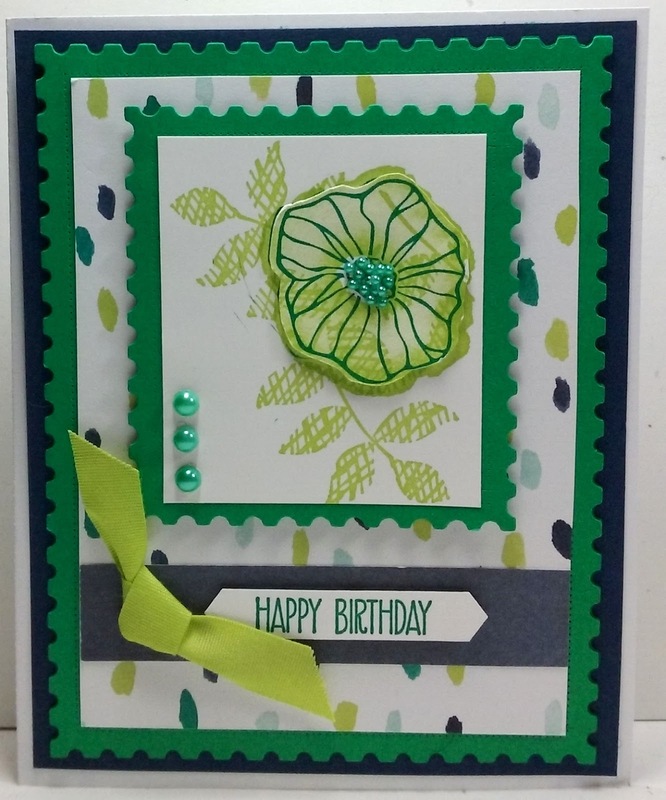 Ingredients: SU Products: Cardstock--Whisper White, Night of Navy, Emerald Envy. Pattern--Naturally Eclectic. Stamps--Oh So Eclectic; Sweet Cupcake (sentiment). Ink--Lemon Lime; Emerald Envy. Punch--Classic Label. Ribbon--1/2" Finely Woven-Lemon Lime. Die--Avery Elle Postage Stamp Rectangles (smaller modified). Darice Pearl Stickers--4 cm + seedlings. Chatterbox verse. Size: 4-3/4 x 6". It's my husband's birthday this coming week-end, and I needed to get his card made this past week. 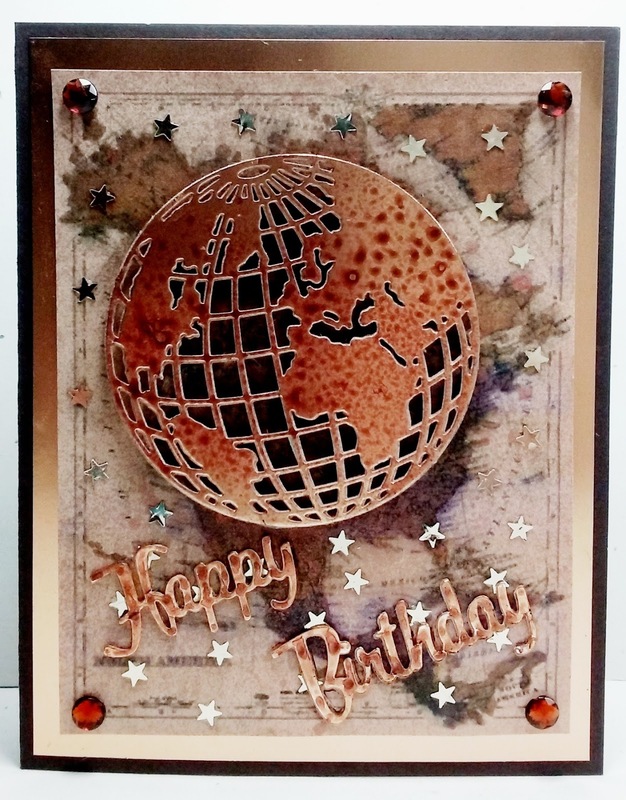 I was anxious to begin, because I had a new Tim Holtz die...the Globe, and ideas were beginning to come fast and furious, especially after I reviewed possible Splitcoaststamper challenges to catch up on. This will be my last card for a while, as my hand surgery is scheduled for Monday, and it will be about a six-week recovery. One challenge needed some shine, another die-cut word(s), another some spritzing and/or splattering, another to use up something set aside to maybe use later, another to be inspired by color, and then there was the one that needed something natural and not man-made...what could be more natural than Mother Earth...a planet! I had printed a vintage map, which didn't print quite right and ended up with some purple splotches, but I loved the vintage look of it and decided to keep it to see if it would fit somewhere...somehow. I decided to re-color the map with my Copics to enrich its color and cover up the wonky purple areas. Then, I added some metallic antique copper spritzing and splattering for even more eye-appeal and/or cover-up! Since my Globe die has longitude and latitude lines, it will work for the Alphabet challenge, letter L. To add depth, I die-cut four globes and four Happy Birthday die-cut sentiments so they would pop up off the card front. I also spritzed the top gold matte foil layers of both with antique copper spritzing and splattering to add even more interest. I had some little tiny metallic gold stars in a cup on my craft tape since early December and decided to scatter those randomly on the card front as well. I was really please with how they looked, so I painstakingly glued each down. 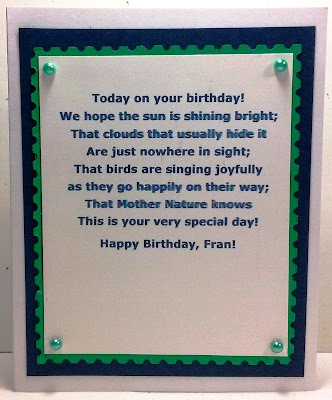 My last step was to decorate the card inside to coordinate with the front design and to compose a birthday verse. I am really pleased with how my husband's birthday card turned out. I love the vintage flair, and I think he will be please. 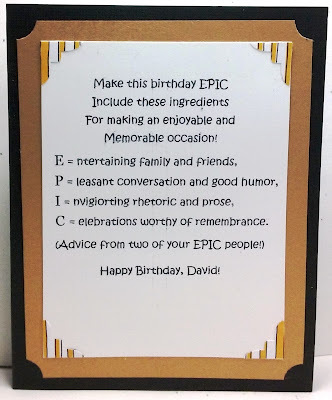 He decided he only wanted one card for his birthday and that was mine, because the store-bought cards are a waste of money he says. 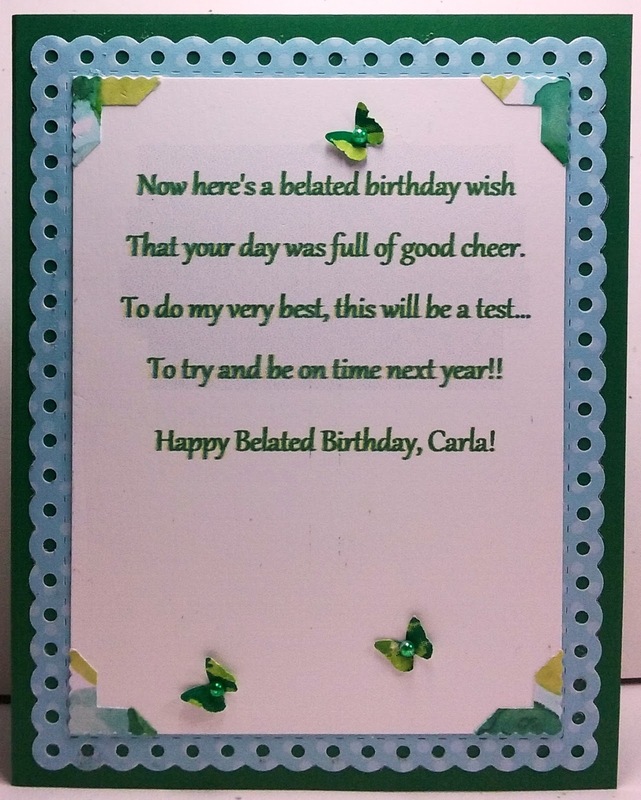 He added that he would rather have a candy bar for a card, and it would be okay if the children need to add a happy birthday paper taped to the bar. I told him perhaps a handwritten tag tied with a string would work! I promised I would pass the word to the klds! I also let them know he was doing his "baa-hum-bug" birthday dance, which he does each year! 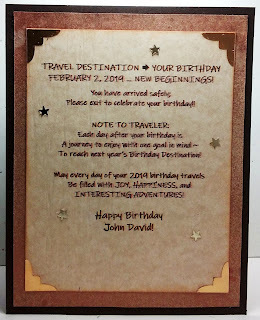 Here is his one and only birthday card below with the inside design pictured as well! Ingredients: Papers: Cardstocks--SU Early Espresso, Darice Timeless Pack (tan), Vintage North America Map (printed from Pinterest); DCWV Solid Golds Stack/ Matte Foil. Dies: Sizzix Tim Holtz Alterations: Globe; Dee's Distinctively Dies: Happy Birthday, Small. Punch: EK-Victorian Corner. Homemade Sprtizer: Folk Art Metallic Antique Copper diluted w/ water. Copic Markers (map coloring). Recollection: Large Copper Rhinestones. Stash: bitty gold metallic stars. Chatterbox verse. Size: 4-3/4" x 6". Sorry that I have been AWOL from my blog due to a flair-up in my arthritic and tendon-deteriorated hands, which prevents me from crafting. My hands had already been earmarked for surgery for several years prior to my knee replacements, but the knees took precedence. Since my stop-gap cortisone shot wore off in October, I needed to make a hand specialist appointment to determine a surgery schedule, but I procrastinated with the holidays. By mid-December, I could feel the handwriting on the wall. I really hoped to put surgery off until late April or May because of a list of personal commitments and obligations that I felt needed to come first, but that really has become almost impossible. A doctor appointment in a few week's will determine the plan. Meanwhile, cardmaking has been almost impossible without severe pain, but despite this, I did get one done in the past few days. My youngest daughter is expecting her first child in March. . .a second grandchild for my husband and me. We are very excited for Sienna Rose to make her permanent home in our family. 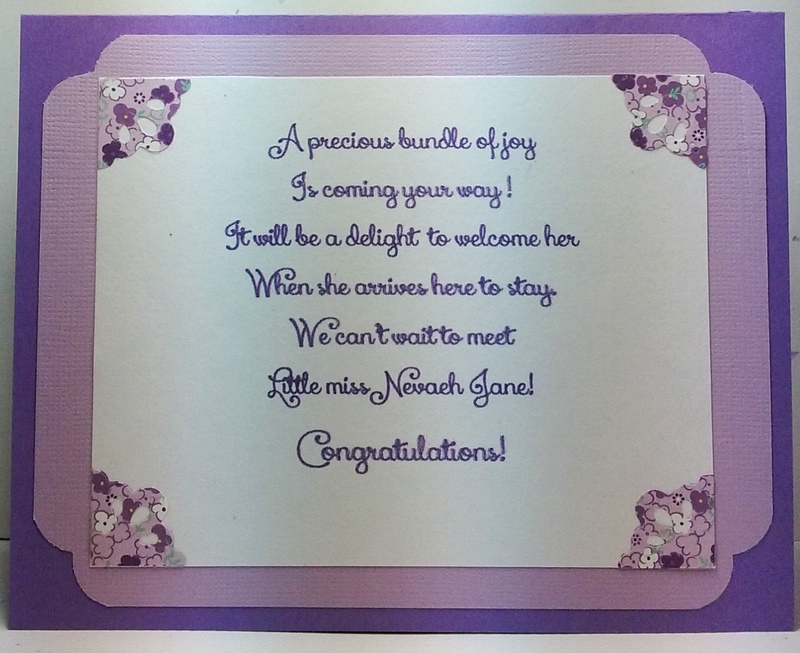 As traditionally happens, the mother-to-be and baby were to be feted with a shower; therefore, I really needed and wanted to make a card! Ingredients: SU Papers: Cardstock, Gingham Gala (2019 Occ./ balmy blue). Other: Patterned Paper. 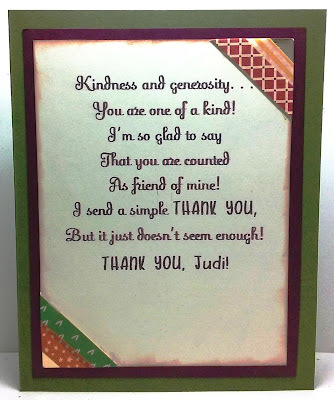 Dies: MFT Stitched Scalloped Edges; Eyelet Oval; Hero Arts: Thank You Messages Frame Cuts. Punch: WRMK Corner: Deco. Copic Coloring (paper dresses, flowers, gems). Ribbon: 5/8" seam binding. Pearl Gems (natural & colored). Chatterbox verse. Fussy-cutting. Size: 4-3/4" x 6." Sunshine on a Serene Scene! 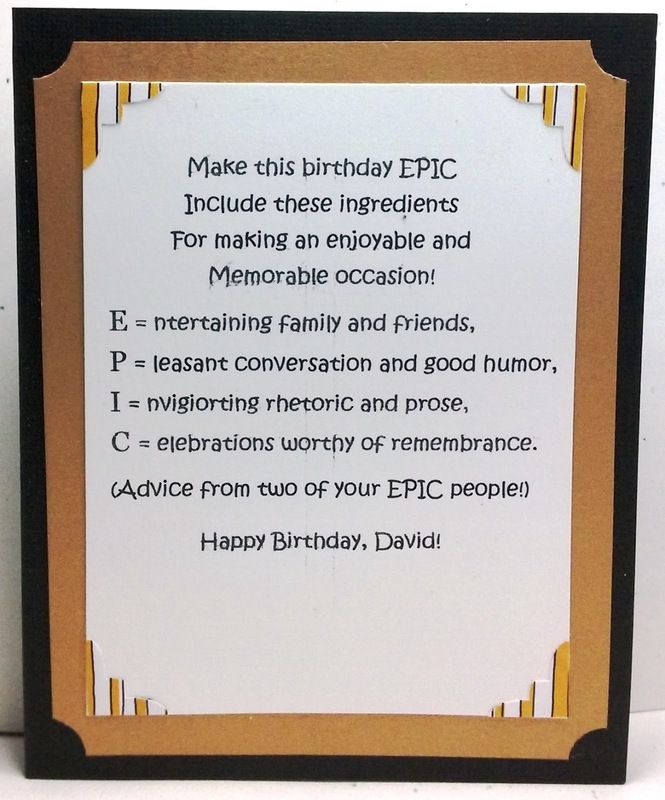 One of my husband's best friends has a birthday at the end of November, and he wanted me to make him a nice birthday card. Masculine cards sometimes play havoc with my mojo. To get started, I focused on the current Splitcoaststamper Alphabet Challenge. I am several weeks behind, so I had a variety of letters to work with. 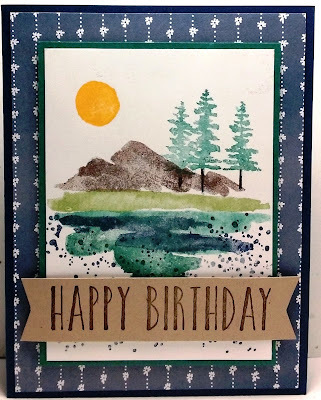 When I saw Letter S/ theme: sunshine, I thought of a scenic card that I made back in January at a card class, using a new Stampin' Up stamp: Waterfront. Our hostess-designer was Luci Kirschenbaum, and I decided to CASE her card design, because I loved it and the stamp set so much. It fits the alpha letter/ theme perfectly as a lovely scene with its sun. For my new card, I made my watercolor scene panel just a bit smaller so more of the deep green mat would show around the edges and contrast with the navy patterned paper background. I watercolor-stamped my scene with less "stamping off" so that I would have darker and richer color hues...not quite so pastel as the design sample. My changes to the scene were to position my trees closer to the mountain base rather than in the green meadow, and I moved the sun a bit higher in the sky to suggest more daylight and sunshine as though it was earlier in the afternoon. I also added more splatters all the way down to the bottom of the panel...I just love splatters! I also made my sentiment into a double fishtail flag instead of a rectangle. For the inside design, I also followed Luci's plan with changes. 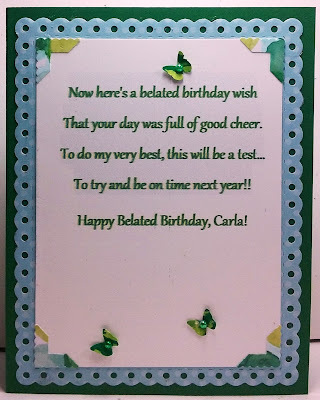 I centered my birthday verse instead using her left offset. I did stay with the left offset for my mountain and trees, but not as far off the edge, so my mountain range is longer. I also raised the images about 3/4-inch so the tree trunks did not sit right at the paper ege. When I was done fussing with it, I was pleased with the end results. Take a peek below, inside and out, I think my husband's friend will like his card. It may remind him of some lovely camping spots he was visited throughout the years, as he and his wife loved to camp as well! 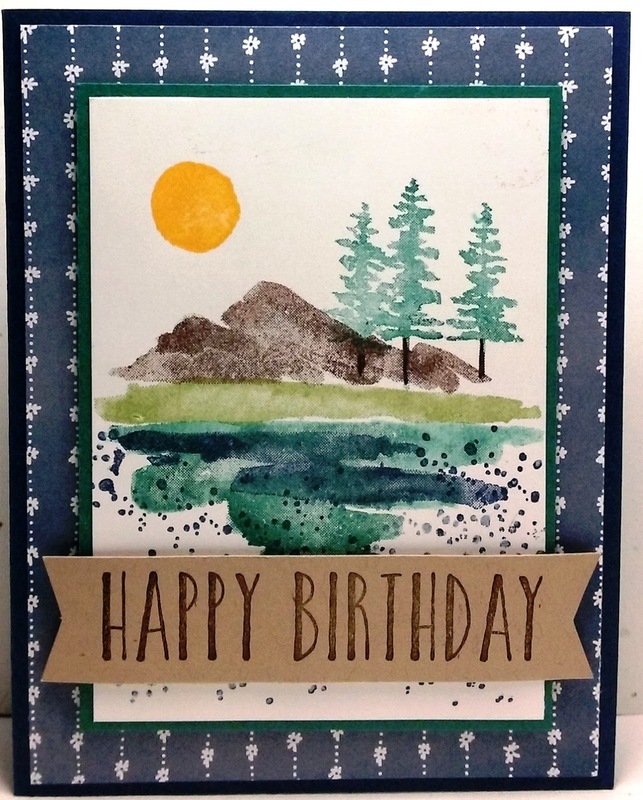 Ingredients: Stampin' Up products: Cardstock--Night of Navy, Tranquil Tide, Whisper White, Crumb Cake. Patterned Paper--Delightful Daisy. Stamps--Waterfront, Perennial Birthday (sentiment/ inside verse). Ink--Night of Navy, Tranquil Tide, Early Espresso, Pear Pizzaz, Daffodil Yellow. Water-base Marker: Black. Size: 4-1/4 x 5-1/2 inches. Thinking You Much Better Real Soon! One of my lady friends that I met at my September Girls' Get-Away has had a set back in her health. I wanted to send her a card to let her know I've been saying some prayers and having positive thoughts to wish her much better real soon! I had a few Splitcoaststamper challenges to get done in my on-going challenge catch-up goal, and with a few of those in mind, I set about to design and make a card for my friend. I needed to use a shade of yellow called Xanthic in order to finish the Alphabet Challenge in Round 9, and with this in mind, I search for a dress on the Inspiration Challenge website with at least some yellow that could inspire me for the rest of my card. I found the perfect floral dress. Now, I knew my card had to have flowers. My layout idea and focal point were inspired by the Featured Stamper challenge, plus I had several old challenges to complete that required a stamped frame, plus an old technique. I had some good ideas. . .my mojo getting juicy, so it was time to find some papers and get started. Take a peek at my finished card below, I think she will enjoy the card, and I know I will enjoy crossing off some more completed challenges on my list! Ingredients: Papers: SU cardstock--Basic Black, Gumball Green, Daffodil Yellow; SU Vellum; Patterned Paper--Basic Grey/ Origins. Stamps: SU--Serene Silhouettes (white flower stems), Lovely Wishes (frame flower); Our Daily Bread Designs--All Mother's (sentiment). Inks: Memento--Tuxedo Black; SU White Craft Ink; Versamark. 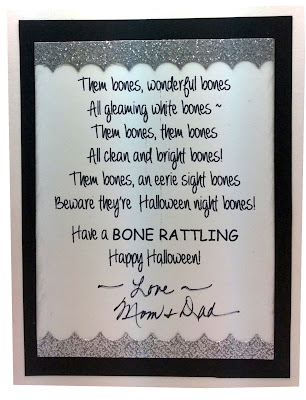 Dies: Sizzix Labels Collection (frame). Punches: SU--Curvey Corner Trio (retired), Bitty Butterfly (retired). SU Black Embossing Powder. SU 2mm pearls. SU Simply Clay: Simply Pressed Clay, Buttons & Blossoms Simply Pressed Clay Mold (2013-14 both retired). Stash: Bitty flower brad. Copic markers: coloring for clay + brad. Chatterbox verse. Size: 5-3/8 x 6-1/8 inches. A Baby's Coming in the New Year? 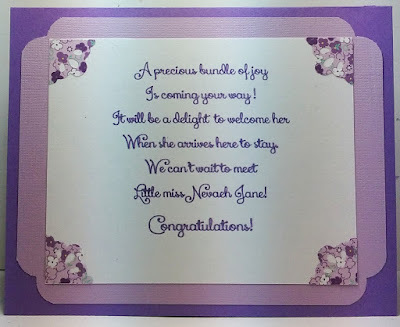 My oldest son's girl friend asked me to make her a baby shower card for her son's first child and her first grandchild. . .a little baby girl! She had some specifics for me to work with, in that she wanted lavender to be the predominate color, it to be very feminine, and to have a baby elephant for the focal image. She also wanted the inside verse to contain the baby's name. Other than those specifics, I could let my creative juices flow! 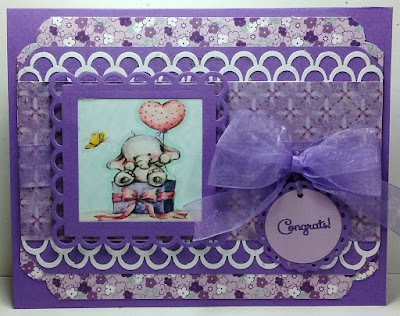 Ingredients: Papers~ Cardstock: Recollections Essentials (Violet); SU Whisper White. Patterns~ Recollections: Purple Ditsy Floral; K&Co.-Watercolor Bouquet-Purple. Stamps~ Wild Rose Studio/ Bella (retired). Ink~ Memento Tuxedo Black. Dies:~Lifestyles Lacey Squares (retired); Sizzix/ SU: Layering Squares; Lifestyles Lacey Circles (retired); Spellbinders Classic Circles LG. Punches~ SU: Curvy Corners (retired); Martha Stewart: Double Loops Edger; QuicKutz Scallop Photo Corners (retired). Ribbon~ Offray 5/8" Sheer Violet. Copic Marker coloring. Chatterbox sentiment tag/ inside verse. Card Size: 4-3/4 x 6-inches. An Angelic Heavenly Host Comes to Visit! I wanted to finished the third and final Pre-Virtual Stamp Night Mini, which required a Christmas card made with the traditional colors of red and green, because these are the colors that Dr. Seuss' Grinch dislikes intensely. I also wanted to play my personal "catch-up challenges" some more as well! So, I went in search of what else I could put on my card beside red and green that would meet other challenges. I found that winged things worked, and if it was a winged angel, formally called a heavenly host, my card would fulfill even more. 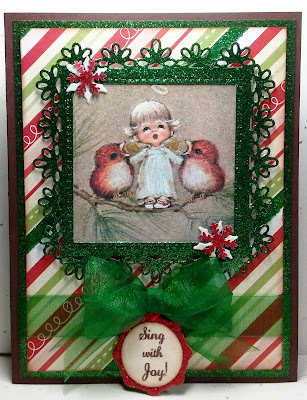 Last year while attempting to make my Christmas cards, I printed a darling pre-colored vintage digital image of a sweet little angel and two wee birds singing together, but it did not get used. I was stoked...my winged creatures from my pre-made stash works for the VSN with no time against me! I had three glittery frames in white, green, and red that I also made for last Christmas and did not get used when my Christmas crafting was cut short with my hand strain issues. I found if I framed my image, another challenge could be met, and on it went. I found some inspiration from the current Inspiration challenge, which is what prompted me to use the angel image. Now, my mojo was really simmering! An older Featured Stamper and Sketch challenge both helped with decisions regarding the layout. Now that I had a basic layout idea in mind, it was time to gather all my materials and tools that I might possibly need. 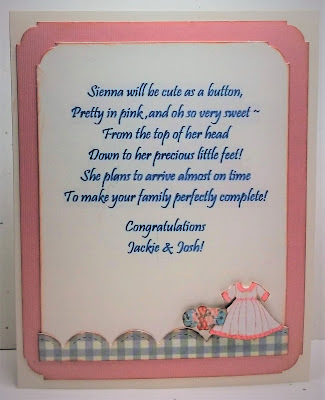 My first step was to find the perfect paper that would work with one of my pre-made glittery frames, plus embellishments, ribbon, dies, punches, etc. I find I always gather more than I end up using, but at least it is at my fingertips if I do need it as time is of essence in the Virtual Stamp Night challenges. I set my timer for one hour, and let the fun begin! I started to get nervous when I had used 40 minutes to cut my paper layers, complete the ink distressing, adhere the layers, add my ribbon band, cut my die-cuts, punch snowflakes, make my bow, and prepare my framed image and pop it up. I still needed to make a computer sentiment layer to fit my red tag die-cut. Fortunately, I had another sentiment saved in my computer that fit a one-inch circle punch. I copy/ pasted it, changed the words and ink color, and it was good to go! Thank heavens my printer did not give me fits as it can do from time to time! That was a close one...I used 55 minutes! I used my extra five minutes to add some Wink of Stella glimmer to my pre-colored image angel and birds, which does not show up too well in the picture. Take a peek at my finished card. . .I think I'm pretty happy with it. I didn't like how much time it took to make the sentiment tag using the computer; it cut the deadline time too close for comfort. Since I do like to use sentiment tags, I've decided to make a bunch in different colors and sentiments and pre-punched them for my stash. They just might come in handy for the VSN main event in December. If not, I am sure they will get used eventually. In addition, I plan to download, size, and print more pre-colored Christmas images that might come in handy, plus die-cut some additional frame styles using different types of paper and colors. I punched more bitty snowflake in more colors. I had white ones pre-punched, as well as silver, lime green and aqua, but no Emerald Green or Red...can you believe that! Not sure why I had lime-green. . .that was interesting! Ingredients: Papers~ Stampin' Up cs--Chocolate Chip (retired); Recollections Glitter Paper--Cherry, Evergreen, Snow; Stripe--Recollections Signature Sugar Plums Pad. SU Ink: Soft Suede (edge ink distressing). Dies~ Spellbinders: Triple Floral Squares (frame), Delightful Circles (tag back). Punches~ EK--1-inch Circle; Recollections--5/8" Snowflake. Ribbon Stash: 5/8" Emerald Sheer. Pre-made Stash: Angel & Birds pre-colored digital image (3 in. 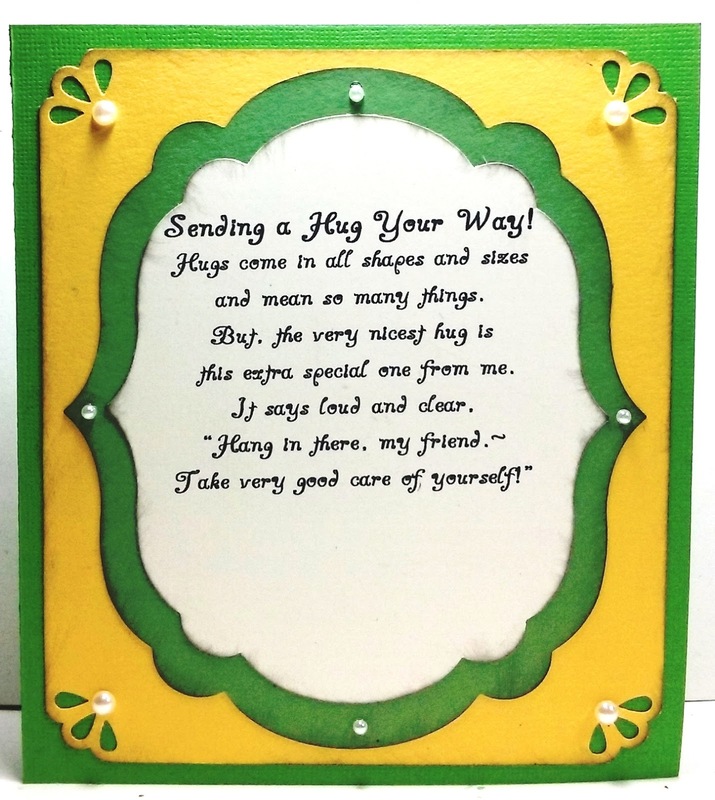 ), Green Glitter Frame. Wink of Stella--Clear & Gold. Stash: Acrylic Sheet (stablizing framed image). Chatterbox verse/ sentiment. Size 4-3/4 x 6 inches. Thank You for the Delightful Gift! I received a fairly unique gift quite unexpectedly...a cedar, chainsaw-made Christmas tree. We had a family gathering a few weeks ago to celebrate two birthdays, and my son-in-law's mother was in attendance. She is a collector of chainsaw wood art, and she brought a gift for me and my two daughters plus my daughter-in-law. They were "carved" Christmas trees using a chainsaw to cut and form them from cedar logs. The tree's branches were painted green with a bit of white snow gracing their tips and the trunks were the natural bark from the small cedar logs from which they was cut. She had decorated each with miniature Christmas lights that could be all white or multi-colored by changing the remote settings. What delightful gifts! I needed a thank you card desperately and immediately. I scoured some of the Splitcoaststamper challenges to find some ideas. I used the Inspiration Challenge for an autumn color inspiration and found a Featured Stamper Challenge with a pretty autumn leaf card. My mind was made up to do an autumn leaf card of my own. I found some other challenges that would fit as well, and if I added green, I could finish Color Letter Z in the Round 9 Alphabet challenge. 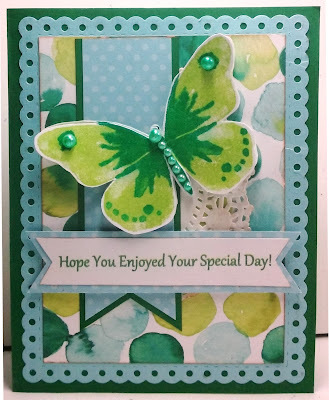 At this point, I remember a card by Liz Thayer that also had a leaf design, so I "borrowed" elements from her card to add to my card as well. This is my finished card, a bit of a modified Liz design than from the Featured Stamper with two more added layers. 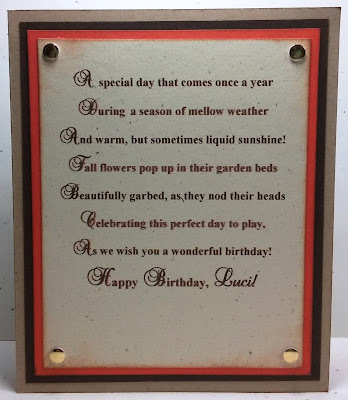 I finished the card off with an interior design to fit the outside and added a Chatterbox verse printed by my computer. 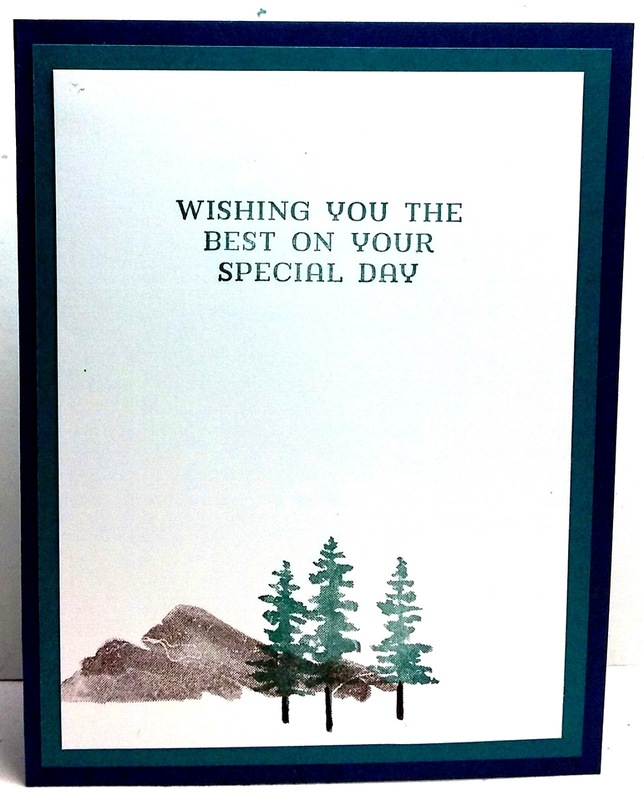 Take a peek below at the finished card inside and out. I think my friend will enjoy her thank you card and also know just how appreciative I am of her lovely gift! Ingredients: Stampin' Up Papers: Cardstocks--Mossy Meadow, Blackberry Bliss, Gold Foil, Cajun Craze, Soft Suede, So Saffron; Patterned--Color Me Autumn (2014 Holiday), Typeset (2014-5 Annual). Stamps: Holiday Cheer, Project Life (sentiment/ 2014 Holiday). Dies: Autumn Accents BigZ. SU Embossing Folder: Hardwood. SU Other: Gold Basic Metal buttons; Washi Tape (names unknown); Dazzling Diamonds Gold Glitz. Ink: Soft Suede ink distressing. Size: 4-3/4x6-inches. Circa 1860's Vintage Christmas Tree! I'm working on the Splitcoaststampers' Virtual Stamp Night Mini Challenge #2, whose theme is "Little Women." The requirement is to make a vintage card in keeping with what their era of Christmas might look like. 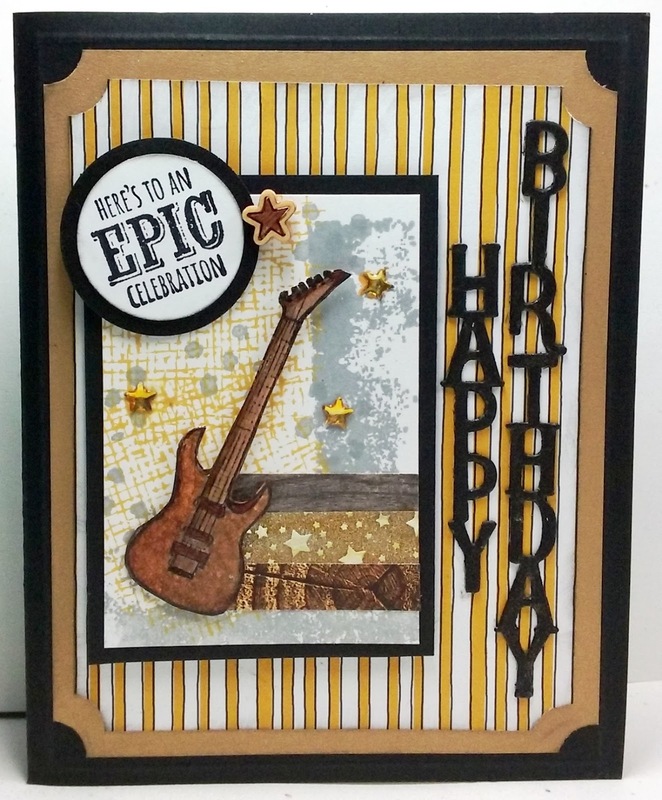 I also went to several other SCS challenges for the layout and embellishment inspiration. I started by looking through my stash of patterned papers for something with a vintage flair. I found two perfect pieces that I was pretty excited about. I checked my layout inspirations and with the paper in hand, my mojo began to simmer. I jotted down a quick sketch of changes and additions I might want to add to the layout, so that I could gather all my tools and materials before I started the timer to begin making my actual card. Ingredients: Papers: Stampin' Up cardstock--Early Espresso, Cherry Cobbler; American Crafts/ The Color of Memories--Vintage Christmas #320369/ Musical Score #341340. Die: Cottage Cuts--Oval Doily. 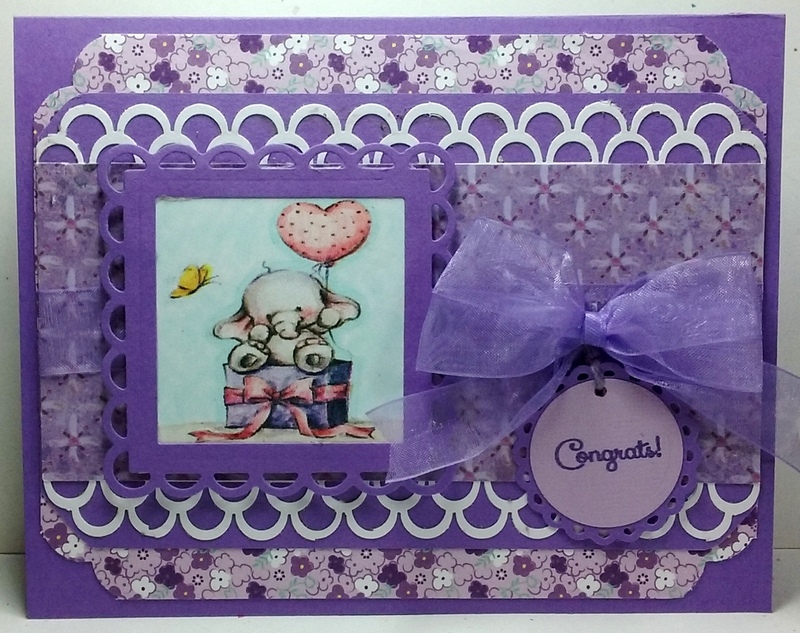 Punch: EK--Scalloped Scallops border; Stampin' Up--Curvy Corners (retired). 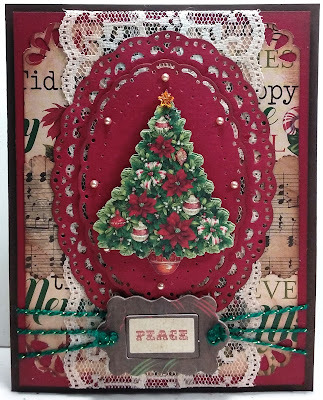 Dimensional Chipboard: K&Company/ EB Versions of Christmas Grand Adhesives--Christmas tree; Recollections Chipboard Accents--Christmas sentiment. Lion Bonbons Jingle Bells (Christmas colors plain/ metallic). Recollections--mini pearls. Stash: Two laces/ modified; Fun Foam (pop up layering). Size: 4-3/4x6 inches. Three Trees & Two Colors in a Christmas Forest! I thought I might dabble in the Virtual Stamp Night Challenge on Splitcoasterstampers. They started a pre-mini challenge in early November. . .the actual event takes place December 2 & December 3. The first pre-challenge was all about trees, even scraggly ones like Charlie Brown's Christmas tree! I decided to use my Sizzix tree dies that I bought last year and did not get to use due to some hand issues that cut my crafting time down to zip! I checked out the Christmas Central website for the Inspiration challenge to see if it could give some ideas of what to do with a tree or trees. I spotted some pretty black and white items, which got my creative mojo going, and I decided a night scene with snowy forest trees would be really pretty. 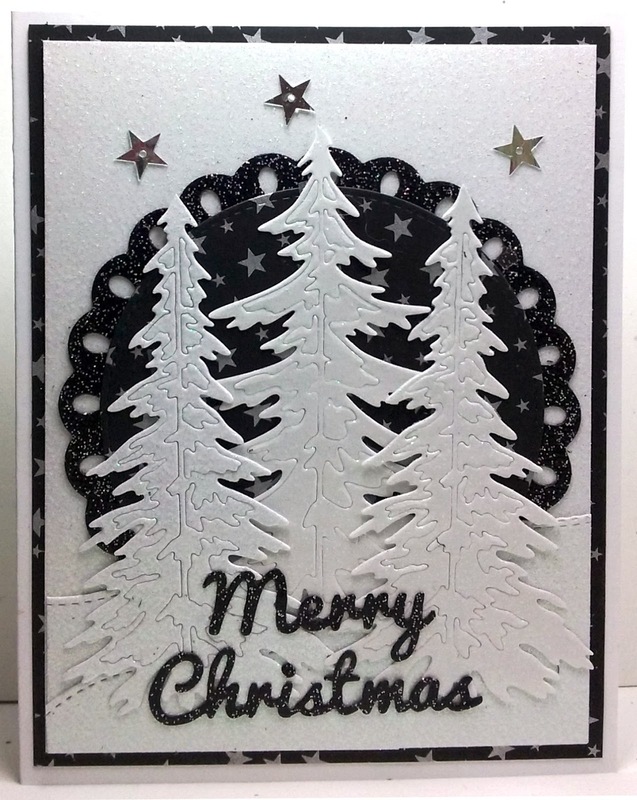 Ingredients: Paper: Stampin' Up--Whisper White (cardbase); Recollections Signature Glitter Paper/ white; Core'dinations--Black Tie; DCWV--Silver Stag Star dsp. Dies: Spellbinders--Tear Drop Circles; My Favorite Things--Stitched Circle STAX, Stitched Snow Drifts; Sizzix TH-Alternations--Woodlands; Cottage Cutz Expressions--Merry Christmas. Stampin' Up: Metallic Stars (retired). Halloween Peeking Out All Over! As mentioned in my previous post, it's that time of year when I get to make Halloween cards...ones I truly enjoy so I can let my imagination run away! My next card is for DD#2, my youngest daughter, and her husband. Since there is a man involved, I had to stay away from anything too feminine! My son-in-law is a Halloween and theme park enthusiast! The two of them just returned from a five-day Halloween adventure vacation to the Los Angeles area, visiting Halloween horror events and Halloween themed parks and thrill rides. Warner Bros. Halloween Horror Nights was their primary attraction visited. I found a verse that was perfect for the card, with a few modification, but ended up having to hand-write it because my printer was on the fritz! 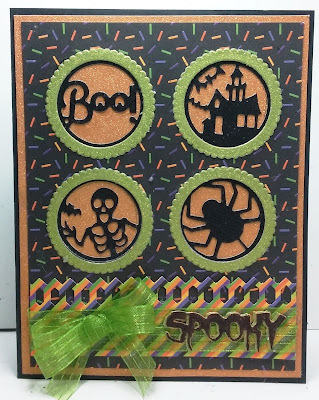 Ingredients: Papers: Stampin' Up cs--Basic Black, Lucky Limeade, Very Vanilla; Bazzill cs--Yam; American Crafts POW Glitter Paper--Caramel; Best Creations Glitter paper--Lime; Pattern Paper--Doodlebug Designs/Ghost & Ghouls--Spookie Sprinkles (confetti), Host of Ghosts (stripe). 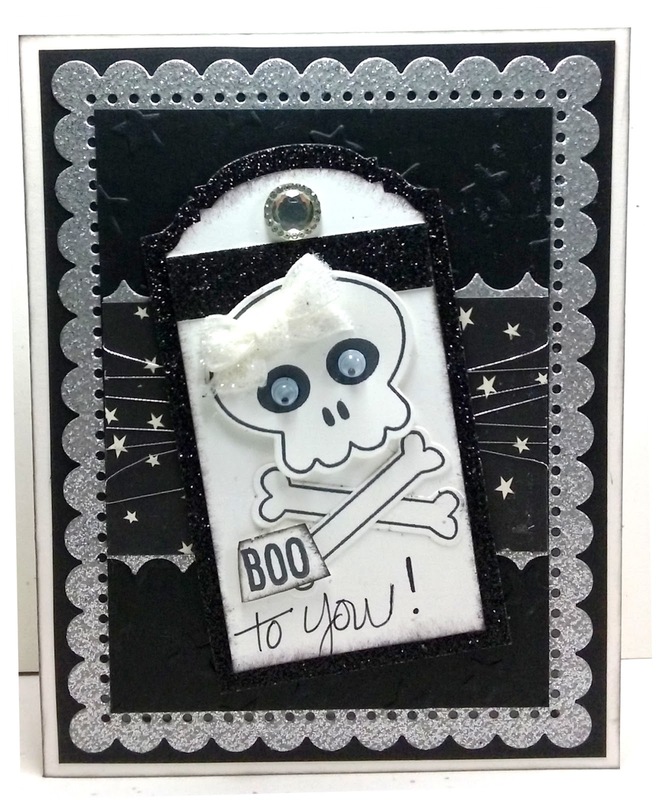 Dies: Impression Obsession: Halloween Cutout Circles; Stampin' Up--Layering Circles; Little B--Halloween Phrases. 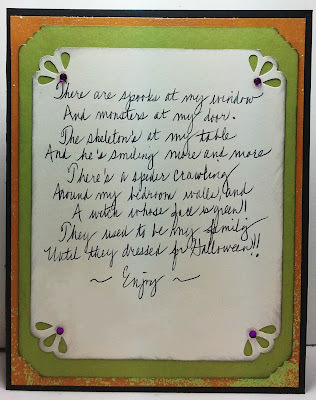 Punches: Martha Stewart edger--Cathedral Lace; Stampin' Up--Curvy Corners (inside-retired). Embellishments: Offray Sheer Stripe--Yellow-Green; Recollections--purple mini rhinestones. Verse/ modified by Chatterbox. Size: 4-3/4 x 6 inches. It's that time of year where I get to make Halloween cards. I just really enjoy putting together interesting and offbeat cards, and my four adult children and their spouses enjoy receiving them. For my DD#1 (darling daughter), I found two challenges at Splitcoasters that spurred along my imagination and my creative mojo began to rumble! I wanted to use skeleton bones on my card, and I pulled out an old 2015 Stampin' Up set that I had not ever inked up. 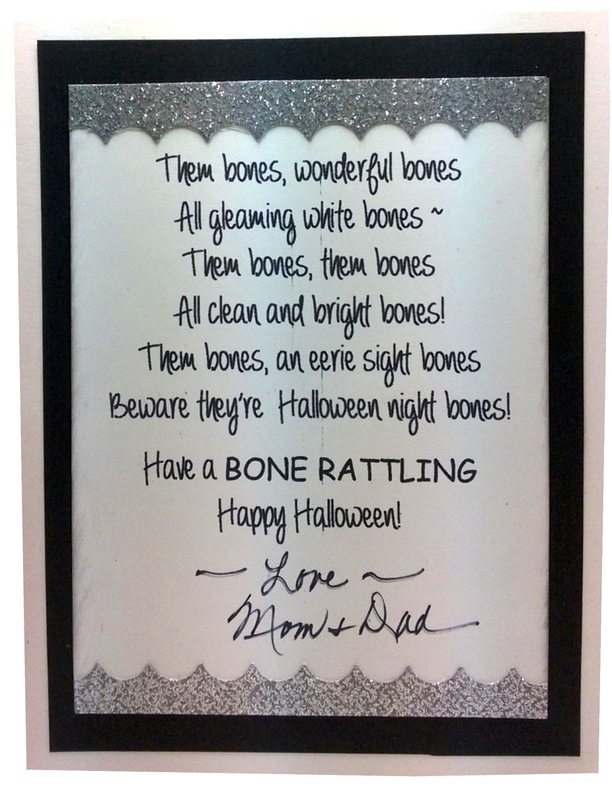 Being that this card would be for my oldest daughter, I thought a few feminine touches might be nice, so my skeleton ends up being a wee girl skeleton but not so terribly scary. I am really happy with the results that morphed as I put it together. 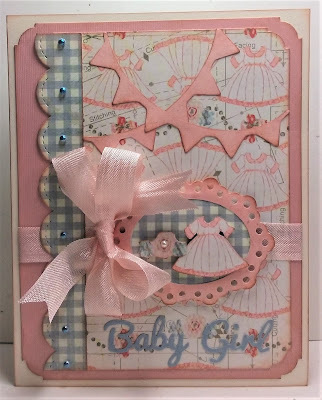 I completed the inside with my very own Chatterbox verse and added some embellishments to coordinate with the card front. Take a peek below. . .I think DD#1 will be delight! Ingredients: Papers: Stampin' Up Basic Black, Shimmer White, Whisper White, Happy Haunting dsp (stars); Darice Core'dinations Glitter Silk--Silver Mist. 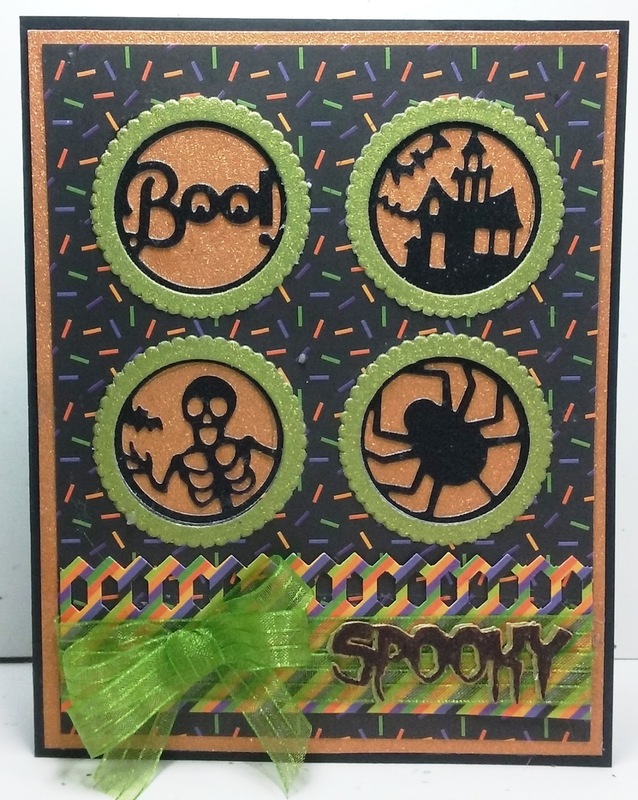 Stamp/Die set: Howl-O-Ween Treat/ Boo To You dies (2015 Holiday). Dies: Pierced Scallop Background. SU Punch: Ornate Tag Topper. SU: Lucky Stars EF. SU Embellishments: 3/8" Glitter Ribbon-White, Metallic Thread-Silver, Iced Rhinestone. Chatterbox sentiment/ verse (handwritten/ computer printed). Size: 4-3/4 x 6 inches. I have oodles of birthday cards to make for Fall, and this one is for a cardmaking good friend. I wanted to make her a Fall card with a little bit of a vintage flair. After checking out several Splitcoaststamper challenges, I knew exactly what I wanted to do! Ultimately, I ended up casing a card designed and developed by my sister, Heidi Gonzales, over five years ago, because I had a stash of her leftover papers and elements that she used, including a delightful "Autumn Wind" digital bookmark image, some the ribbon, and the recycled lace. 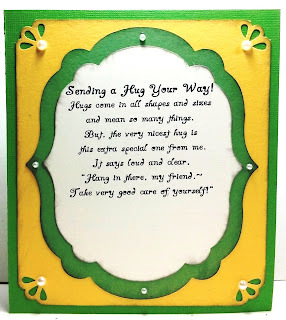 I made my own oval layered backdrop and sentiment to finish my card. In keeping with one set of SCS challenge requirements to add things of Scottish, Irish, and Welsh tradition, I have included the plaid on my card, which is important to all three countries, and depicts their family or clan heritage. No two families or clans use the same plaid. I've also included acorns, representing the Acorn Oak, which once formed over 1/3 of the tree coverage in all of the British Isles and was important to the shipbuilding industry. 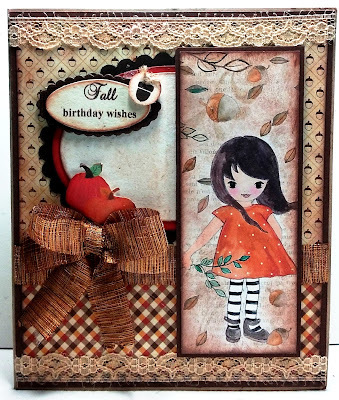 My thanks to Heidi for allowing me to case her card...it has such a lovely vintage flair and perfect Fall elements! Take a peek at the results of my finished card front, as well as my coordinating interior design and Chatterbox sentiment and verse. 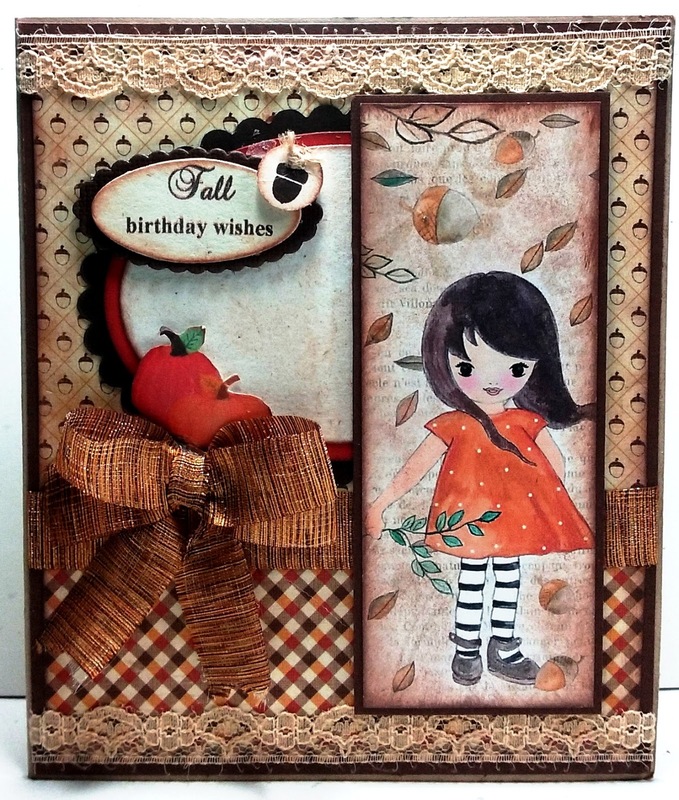 Ingredients: Papers: Stampin' Up Cardstock--Crumb Cke, Early Espresso, Tangerine Tango, Very Vanilla, Antique Linen. Stash: unknown acorns and plaid. Digital Pre-colored bookmark: Autumn Wind by Digital Papers. Chestnut Roan ink distressing. Dies: Stampin' Up--Layering Ovals; Spellbinders--Classic Ovals LG, Classic Scallop Ovals LG, Petite Ovals LG, Petite Scallop Ovals LG. Recycled Lace (bottom edging on old over-blouse. Ribbon Stash: Silk Variegated; Pumpkin Stickers; Gold Metallic gems. Linen Twine (acorn). Chatterbox sentiment/ verse. Size: 4-7/8" x 6". Thank you for visiting my blog! Leave a little comment after a post. . .I'd love to hear from you! I am a wife whose husband is most understanding of my love for paper- crafting, taking time to "ooh and ah" over my newest creations! I am the mother of four lovely adult children with three spouses. I became addicted to paper-crafting, especially cardmaking, in the fall of 2009! My mentor is my sister, Heidi Gonzales (My Lil' Scrap Corner), who is sooooo enviably creative! I love to crop with my Mom and sister and my friends. Unfortunately, Mom & Sis live in another state so it it can not be an everyday event!